I start to feel a little bit thrown off when I don’t share my workout recaps on Sunday’s but we were in Boston over the weekend and I didn’t bring my laptop. So, hi! How are you? We had a GREAT time in Boston over the weekend and I am going to tell you all about what we did (and ate) hopefully tomorrow. 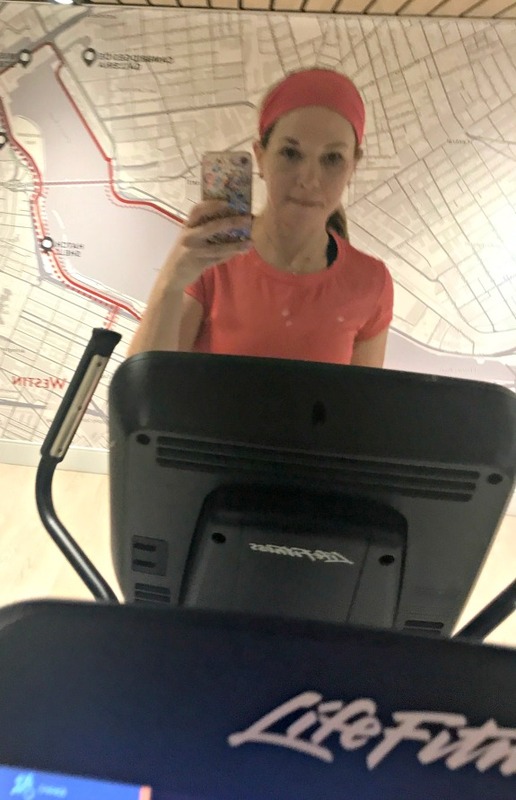 For now, let’s quickly recap the rest of my week in workouts before getting to my experience with the Peloton spin bike at the hotel yesterday morning! This week I fell into a pattern of daily, short Pure Barre workouts in conjunction with my mileage. It wasn’t exactly planned, it was just what I felt like doing every day! 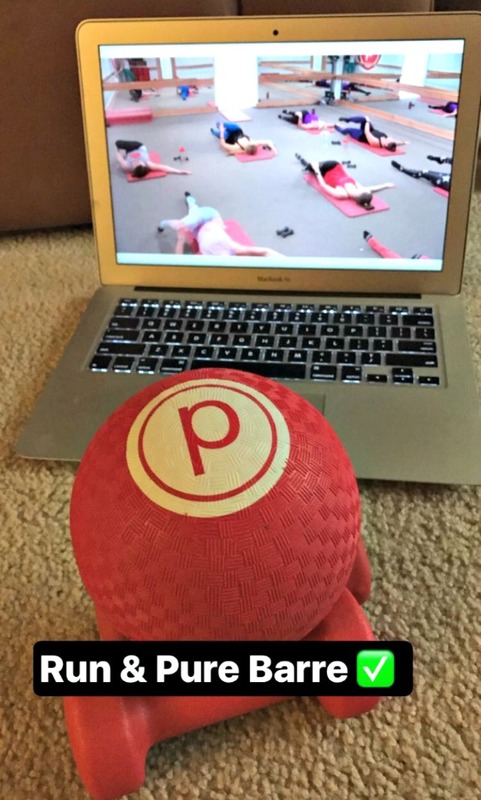 This is another reason why I love Pure Barre On Demand – I have all of the workout options at my fingertips. So sometimes I opt for 30 or 45 minute Pure Barre workouts, and sometimes I just feel like targeting a specific area for a really short amount of time. Just a quick 5 minute Pure Barre workout for the seat. I combined 2, 5 minute workouts (one for seat, one for abs) and then went outside to run. 8 miles for today which flew by fairly quick. 10 min Seat & Abs plus 5 min for arms. Our flight was early in the morning so we were not affected by the weather but there was definitely no time for a workout, especially a long run! There’s always next week. So whenever we go to Boston, we like to stay at one of the hotels in Copley Place. We love the location and yes, I love that the hotels are all connected to all of the great stores. You barely have to go outside! We chose the Westin Copley Place this time which left me excited for their fitness studio and workout options. 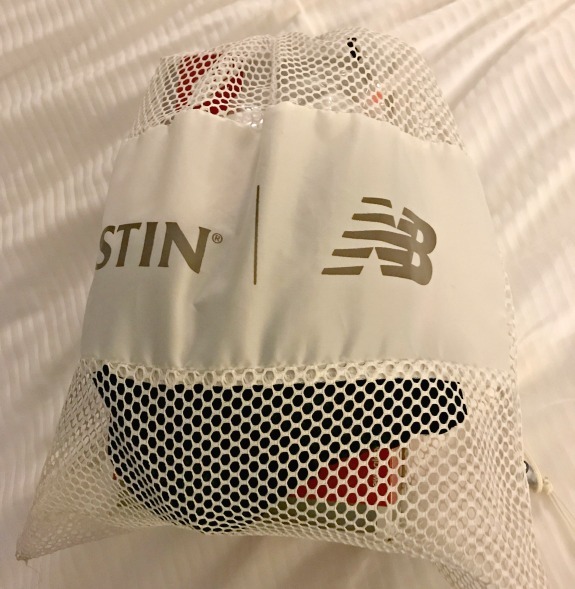 In addition to their really nice hotel gym, they offer New Balance Gear Lending which meant I didn’t need to pack my running shoes or gym clothes. 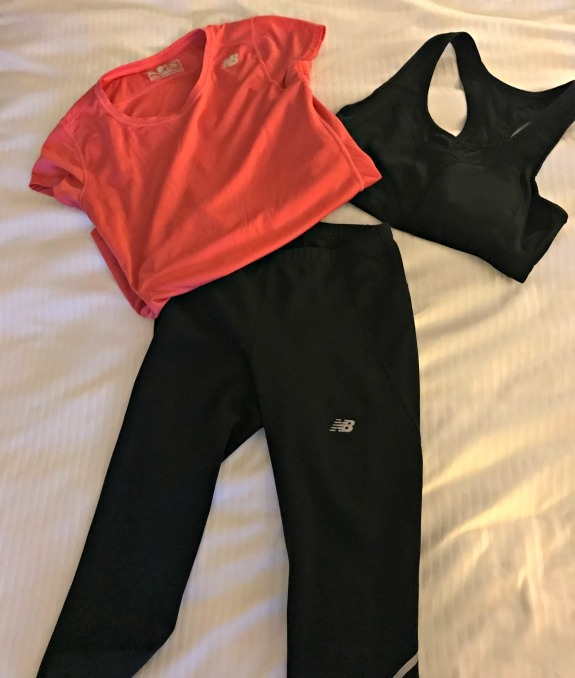 For $5, I just gave them my size and they provided me with a New Balance sports bra, top, capri pants and sneakers. Since we were only in Boston for the night, I was packing extremely light. It was really nice to not have to pack my gym clothes and running shoes and then extra special to not have to pack up my sweaty, used gym clothes and wash them when I got home. They had my size in everything except the sports bra but it really wasn’t a big deal. Sizing up in a sports bra for one workout wasn’t an issue. 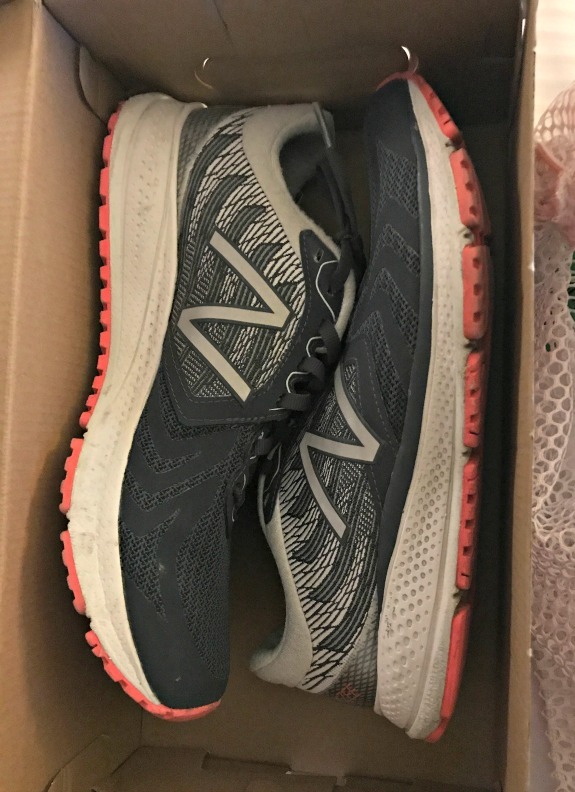 The New Balance shoes were fine too. I didn’t plan on running so it really didn’t matter how well they fit. They fit enough. The end. My main plan for Westin’s Workout Studio was to use their Peloton bike! I saw it advertised on their website when I booked the hotel and was excited the entire time in anticipation of trying it. The Westin really should have said that they only have ONE Peloton bike. I was totally expecting at least two or three! So if they were only going to have one bike, they should be offering some sort of advanced sign up/reservation service so that you don’t walk into the gym whenever you feel like riding and then have to wait. The guy who was on the bike when I got there was off within 30 minutes so I went on next. Yet still, there were a good six other people in the gym at the same time as me and we could have had a problem if someone else had their eye on the Peloton like I did. Here I am impatiently waiting for the Peloton to free up while using the elliptical. Once the guy finished his spin class over there on the Peloton, it was my turn. I chose a 20 minute cycling workout. Since I had already peddled a while on the elliptical plus spent some time with the free weights, I wasn’t looking for a longer workout. For me, this ride was just as good as spin class. The bike itself was easy to position and as good as any I’ve used in a spin class. I’m pretty good at virtual workouts like this since I have been doing Pure Barre from home now for years. So maybe I’m just used to this type of atmosphere but I would totally recommend a Peloton. I hope I get another chance to try one. Maybe the gym in my community can add a few! Have you ever tried a Peloton? What did you think? Ever do the gear lending at a hotel? I’ve never tried a Peloton bike. How odd that a big hotel like that would only have 1 bike. At least have 2 so people don’t always have to wait! What’s special about a peloton bike? 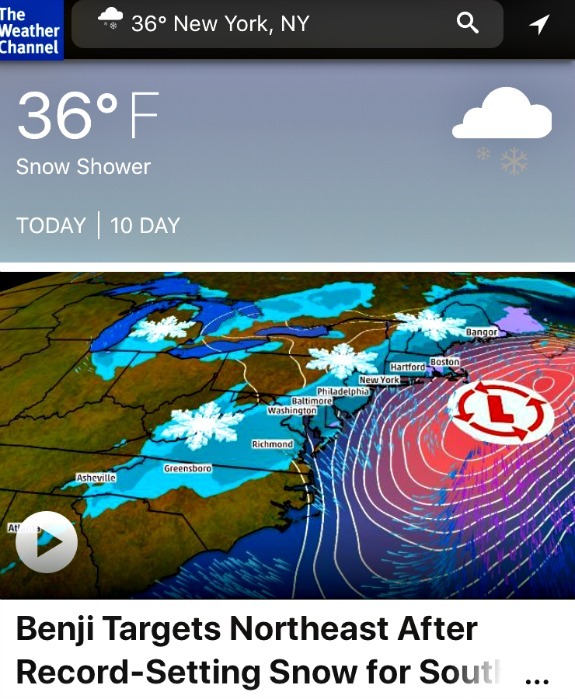 I’ve heard the name before but that’s about it! Looks like a regular spin bike to me but I think they’re much more expensive? It’s great you got to try one out and rent some gear! So the peloton is one of those virtual spin class workouts. A lot of people purchase the peloton for their homes and then you have access to a ton of classes! it’s really super cool. Tons of choices and it live streams the other people in your “class” in the corner with their name and speed (at least that’s what I think, this was my first time). 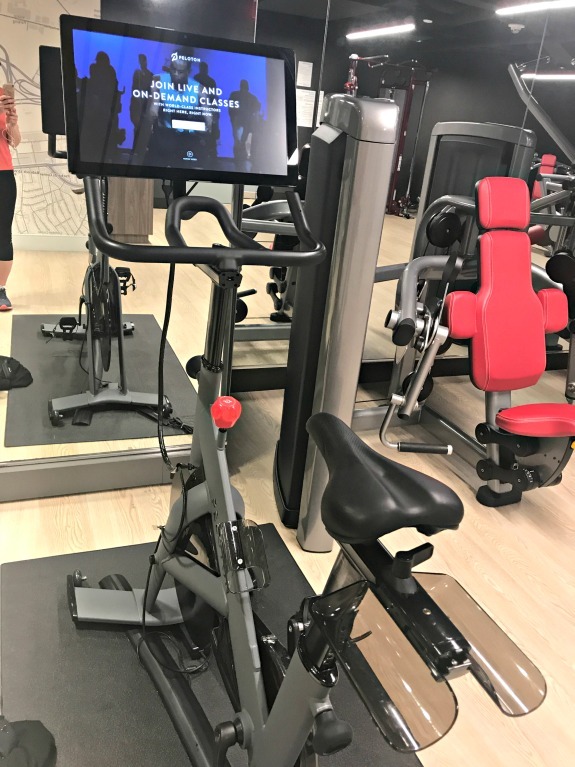 So yes, it’s a regular spin bike but the different part to it is that you don’t have to leave your house (or for me, the hotel gym) to experience the class part since the class was on the screen at the front of the bike. I am hoping that the gym in my community adds one or two of these bikes because I really enjoyed it just like I enjoy Pure Barre from home! That bike looks so cool with the built-in virtual workouts! And that’s ingenious how they gave you clothes – packing stinky clothes for the return trip is one of my least favorite parts of exercising on vacation. Love the Peloton—my brother has one at his house and uses it ALL the time. He has his favorite instructors and is part of the “cult like” facebook group. LOL. I have done it at his house before and it’s fun….and love that you can do it whenever!! Also the varying class lengths is helpful! That hotel definitely needs more bikes! Was the hotel gear new? Or they just wash and give to the next guest? Never tried that before! So the socks were new and I got to keep those (forgot to mention that!) – Since it’s a gear lending, I assume it’s not new but it was totally clean and washed. I tried not to think about it beyond getting excited that for $5 I had workout clothes that I didn’t have to pack or clean. Everything seemed like new to be honest and the shoes seemed barely worn and new. It was totally worth it for the one workout! Now that i have a basic spin bike I don’t really feel the need for anything fancier. Plus I prefer to do my own thing and not follow workouts! Im sure I would get a much better workout if I took a class though. Thats awesome that the Westin provided workout clothes and shoes! I think you would enjoy one of these virtual classes on the peloton if you ever got a chance to try one. It’s a nice way to shake up routine!